Superstar HKS ran away from home leaving behind an HK$18000 debt to some guy named Rain. 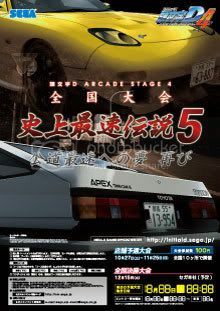 Reports say he spent $8000 on a second hand jacket in Japan and played wangan instead of repaying his debt. "Don't dive under water, you better call me and talk about it before Jan 4 or i'll be pissed off"
HKS' brother then gives Rain his dad's number and a heated exchange ensued. HKS has been gone for about 2 weeks and his phone has also been cut off. He doesn't keep in touch with friends or his team, Prodigy'z Opus. People are also coming out and revealing HKS' personal life and apparently he's been playing 4 girls at once. More news to follow attendance of SEGA trade show July. 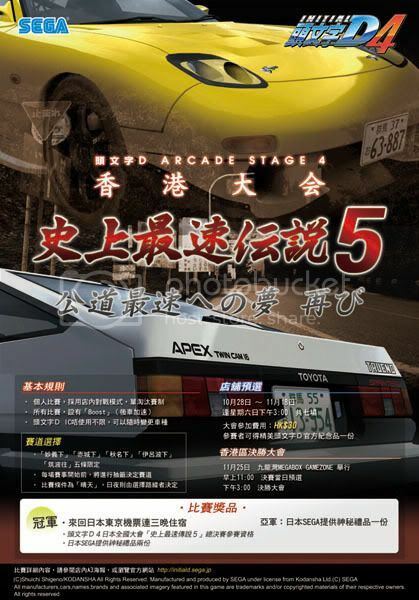 Rumors from Japanese sources say that a new version of the driver is on test for a AOU'08 launch. The game includes two new courses and new cards. Will try and get more detail before the end of the year. ID 8 tournament at Round 1 San Jose? When submitting a tournament, you MUST include detailed information so that people know what is going on. For best results, it is recommended to advertise a month in advance.